Iraq's Unmaned Airial Vehical (UAV) efforts began in the late 1980s with the development of small Remotely Piloted Vehicles (RPVs) for surveillance and reconnaissance roles and continued in 1990 with the attempt to convert a MiG-21 fighter aircraft into an RPV. The MiG-21 program eventually failed in 1991 and was abandoned in favor of smaller UAV's until 1994-1995, when Iraq resumed efforts to convert a manned aircraft into an RPV, this time with the Czech L-29 trainer aircraft. Ultimately, the L-29 RPV too was a technical failure and had its funding terminated in 2001. Iraq then decided to pursue the smaller UAV's developed after the Gulf War. In November 1990, MIC and the Iraqi Air Force Command embarked on a program to modify the MiG-21 fighter into an RPV for use in one-way "suicide" missions. The operational concept was for the aircraft to take off under remote control, presumably by a ground station, then after reaching a certain altitude control would be transferred to another, piloted aircraft in the area. The piloted aircraft would then remotely fly the MiG-21 RPV to the target area whereupon control would be transferred to the RPV's autopilot for the terminal phase of the mission. The Iraqis equipped the MiG-21 with an autopilot from the MiG-23 fighter, due to that autopilot's better capability to ensure stable flight and to support all the necessary electrical and mechanical systems. The MiG-21 RPV was also fitted with servo-actuators for the control surfaces, throttle, and brakes. The remote-control system used was a German system produced by the Groupner Company, with eight channels, and operated on a frequency of 27 MHz. Iraq admitted that the MiG-21 program was intended to be used in conjunction with Chemical or Biological Weapons (CBW). The simple onboard sprayer system tested by Iraq would have been operated by a timer that would be set before takeoff. This RPV was intended for a one-way flight, flying until its fuel was exhausted. An aerosol generator for the dispersal of biological warfare agents or toxins was developed by the Technical Research Center at Salman Pak by modification of helicopter-borne commercial chemical insecticide disseminators. These modified aerosol generators were assessed as suitable for the dissemination of BW agents from helicopters or slow moving fixed-wing aircraft and are referred to as Zubaidy devices. UNSCOM had evidence of a parallel development by the Technical Research Center of a similar device, probably for delivery by drones. Iraq officially denied all knowledge about this second device, but this denial is inconsistent with indications from interviews. It is unknown whether development of this second device continued to deployment, but the possibility exists that it did and that such a weapon system still exists in Iraq. Following the failure of the MiG-21 RPV program in 1991, Iraq's Military Research and Development Center (MRDC) in 1995 began a program call Al Bay'ah to modify the Czech L-29 trainer aircraft into an RPV. According to a report, in 1997, MRDC's Drone Directorate became the Ibn-Firnas Center and continued with the development of the L-29. Ibn-Firnas modified the L-29 with a remote-control system using four cameras (primary and secondary forward view; primary and secondary cockpit view) feeding two displays at stations in a control van adapted from the control system of the Italian Mirach-100 UAV. Initial taxi tests of the L-29 RPV took place at Al Rashid Airfield in Baghdad, but due to an accident (the aircraft impacted the runway barriers), Ibn-Firnas moved the program to Al Mutasim Airfield (also known as Samarra East Airfield). The first flight test occurred on or about 13 April 1997 and was successful, followed by a second successful test in June 1997. These tests remained in the airfield traffic pattern. The third flight test was intended to test the maximum range of the video and command signals. The aircraft successfully flew 60-70 km southeast of Al Mutasim, but then the ground station lost the video signal from the aircraft and it crashed. Following this, Ibn-Firnas attempted to improve the aircraft's controllability by installing the auto stabilizer system from the Chinese C-611 anti-ship cruise missile. This modification was largely unsuccessful due to excessive instrument drift. The Czech firm Aero Vodochody sold 78 L-29 and 90 L-39 trainer aircraft to Iraq between the late 1960s and early 1980s. 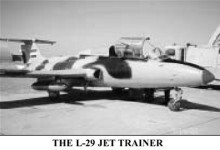 Given the difficulty in acquiring spare parts for these aircraft, by some estimates only a quarter of the L-29 aircraft which were sold to Iraq were still in service as of 2002. After being briefed on the program in 1997, 'Abd-al-Tawab 'Abdallah Al Mullah Huwaysh, the Minister of Military Industrialization, believed the program was foolish for a number of reasons. First, turning a manned aircraft with a 500-km range into an RPV with a UN-mandated maximum range of 150 km was an inefficient use of the aircraft. Furthermore, at the time of the briefing, Ibn-Firnas had not been able to extend the range of the aircraft beyond 70 km due to line-of-sight limitations with the ground control station. This short range would limit the RPV's utility as a reconnaissance system. 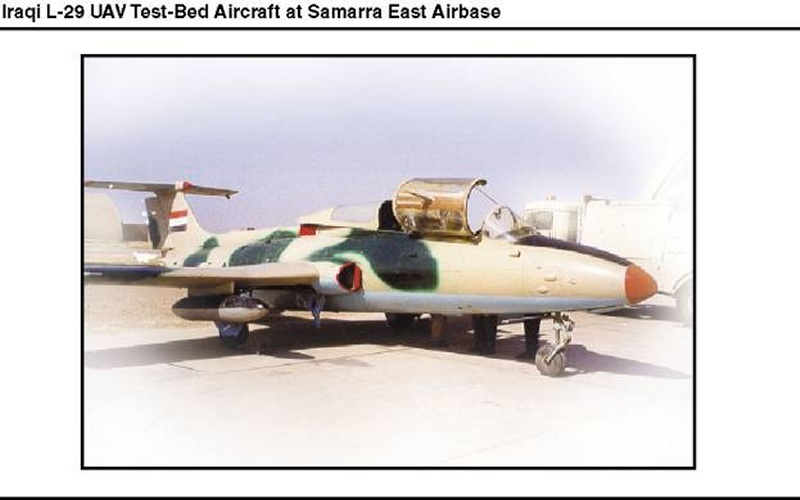 Finally, Huwaysh felt that there were too few L-29 aircraft available for conversion and that they were too expensive to operate for the stated mission, believing that smaller, cheaper UAVs were a better option. The mission given to the L-29 RPV remains unclear. Multiple sources have described different roles and missions for the L-29 RPV. These include acting as a decoy for coalition aircraft, an air defense target, reconnaissance, and potentially a CBW delivery platform. ISG was not been able to confirm or deny that the L-29 had an intended CBW delivery role. In interviews conducted by the Iraq Survey Group (ISG), Huwaysh expressed doubt in the stated purpose of battlefield reconnaissance. According to Huwaysh, Iraqi officials never tested reconnaissance cameras on the L-29. Further, while the Air Force was the most likely customer for such an aircraft, it was not involved in the RPV development and did not appear to be interested in the program. In November 2003, Huwaysh stated that the L-29 was a "100 percent replacement for the MiG-21" RPV and was intended to fulfill the same mission as the MiG-21. When told that Iraq had declared the MiG-21 RPV was intended to be a CBW delivery platform, Huwaysh responded, "Whatever knowledge you have of the MiG-21 is directly related to the L-29." He further stated that the L-29 was even better suited for CBW use than was the MiG-21. Due to these conflicting reports, ISG could not confirm or deny an intended WMD delivery role for the L-29 RPV. The target drone mission for the L-29 RPV, as described by a former Iraqi Air Force officer who worked on the program from 1997-2002, was consistent with Western practice for AAM and SAM live fire training. Further, Huwaysh reported that the number-one lesson Iraq learned from Desert Storm was the need to significantly improve air defenses; a target drone of this type could be used to test new air defense systems and to train crews. However, Huwaysh did not associate the L-29 RPV with this mission. Finally, the size, operating cost, and complexity of the L-29 exceed the requirements for a battlefield reconnaissance platform. 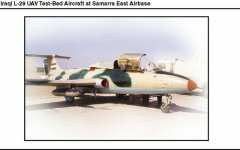 On 06 January 1999, Jane's Defense Weekly cited the UK Ministry of Defence as reporting that Iraq was converting some of its Czech-built L-29 jet trainers at the Tallil airbase into unmanned aerial vehicles (UAV) for use in delivering chemical or biological warfare agents. The "anthrax air force" at the Al Sahra Airfield was targeted by US/UK forces during Operation Desert Fox in December 1998. According to the British dossier Iraq's Weapons of Mass Destruction released in September 2002, information derived from intelligence were pointing to Iraq having attempted to modify the L-29 jet trainer to allow it to be used as an Unmanned Aerial Vehicle (UAV) potentially capable of delivering chemical and biological agents over a large area. 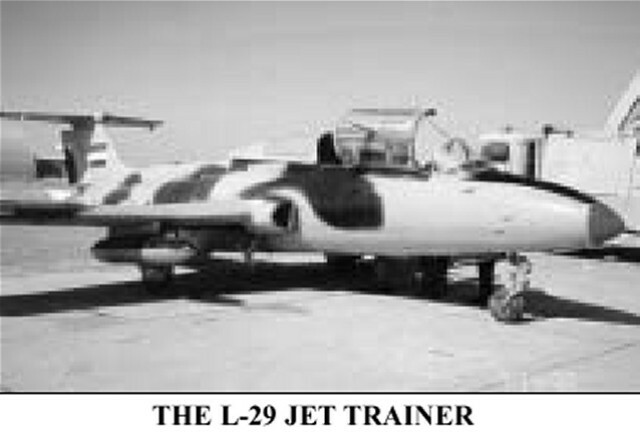 A CIA analysis cited the L-29 program, noting that these refurbished trainer aircraft are believed to have been modified for delivery of chemical or, more likely, biological warfare agents. Some US officials minimized the danger the L-29s [and the newer unmanned vehicles] might pose, arguing that they are slow, low-flying and could be easily spotted and shot down. But other officials were concerned that they could have been used in a terrorist-like attack against an unsuspecting civilian population. The Bush administration placed more emphasis the threat of smaller unmanned vehicles which could be controlled from greater distances [if Baghdad had been able to gain access to sophisticated software and communications links].